Avengers: Endgame is now only a few months away from hitting theaters and Marvel Studios is doing an excellent job of keeping everything under wraps. With that being said, there have been quite a few toy leaks from the movie that have made their way online, from regular action figures, to LEGO sets, and the Funko Pop! figures. The Russo Brothers have claimed that the toy leaks really aren't all that accurate, but that sounds like some misdirection at its best. We now have a look at the Tony Stark Pop! figure and it shows off some new details about the mysterious Quantum Realm suit. Tony Stark is currently floating through space with Nebula and about to die. At least that's what the two trailers for Endgame have shown us thus far. But, there was a brief tease of some work being done in the last trailer to possibly get back home and join the rest of the surviving team. We've seen the rest of Earth's Mightiest Heroes in the mysterious white suits, and now we have a decent look at Stark in his. It has not been officially confirmed that these white suits are going to be used to navigate the Quantum Realm, but it is widely believed, especially since they look so similar to Ant-Man's Quantum Realm suit. Since the goal of Endgame is going to be to reverse the Decimation, time travel is going to be a factor, though we're not sure how at this time. The Funko Pop! Tony Stark figure features the white Quantum Realm suit with the Avengers logo, which we have seen a bunch of. However, this new image shows off the same device that the characters had on their wrists back in some old leaked set photos. It's unclear what these devices are, but there has been some speculation that they are some of Hank Pym's technology. The Pop! figure is going to be a Target exclusive and it glows in the dark. Some of the very first leaked pictures from the set of Endgame featured a remake of the epic Battle for New York from the first Avengers movie. However, this time around, Scott Lang is with the crew when he obviously wasn't there the first time around. This was really our first clue that time travel was going to factor into the movie. Again, it's just unclear how everything is going to work out, which is exactly the way that Marvel Studios wants it. Endgame hits theaters on April 26th. Before that, Marvel Cinematic Universe fans have Captain Marvel to look forward to in a week from now. In addition to the Quantum Realm and time travel, many fans are wondering how Carol Danvers will fit into this story and how she will be introduced after Thanos wiped out half of the universe. Thanks to Samuel L. Jackson, we do know that she has the ability to time travel, so that might be the key to figuring this all out. 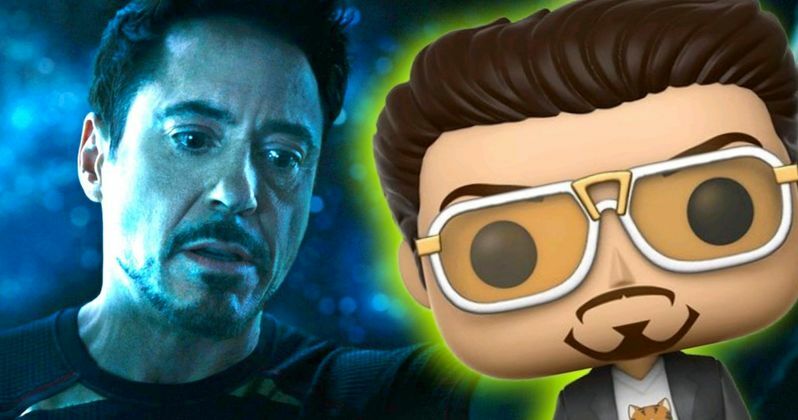 You can check out the Tony Stark Funko Pop! figure below, thanks to Reddit.